Just a quick reminder that I will be exhibiting in Artist Alley at the Baltimore Comic-Con this weekend (table A109). The convention beings on Friday, September 5th and will run until Sunday, September 7th; however, I will only be attending the convention for two days: Saturday and Sunday. I will not be able to get down to Baltimore until late on September 5th, so I will not have my table set up that day (sorry to those folks who only have Friday tickets). 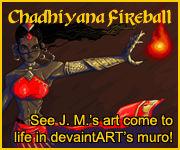 That said, I’ll be trying out a new display, which I hope will attract more attention, and will have the assistance of my very lovely girlfriend, who will be wearing the first ever Chadhiyana t-shirt (designed by her, with finished art by myself). What’s more, a very limited quantity of this t-shirt will be available at the convention (in both men’s and women’s cuts). As of now, I don’t have the shirts in hand, so I can’t offer a picture of them, but they are black, with Chadhiyana’s fiery eyes on the front and the new Chadhiyana logo on the back. If you’re interested in owning a t-shirt, make sure you get to my table early. This is the first time I’ve brought shirts to a convention, and I’m hoping they’ll be a popular item. 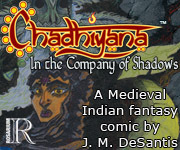 Other than that, I will have copies of the second edition of Chadhiyana (which sold well at the Boston Comic Con last month), as well as prints, other books and comics, and of course, convention sketches are available. So, if you’re attending the show, make sure a visit to Artist Alley A109 as part of your event plans or just keep your eyes peeled for the girl in the black Chadhiyana t-shirt. She’ll point you in the right direction. For more information on the Baltimore Comic-Con, visit baltimorecomiccon.com.